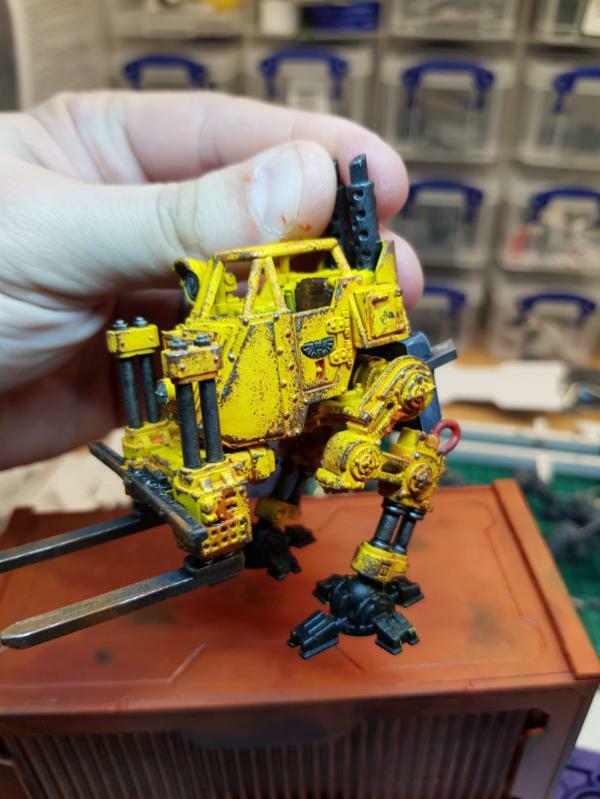 Still trying to remember how this painting malarkey works after my long absence, but yellow was always my favourite for weathering, seems to take a variety of techniques very easily. 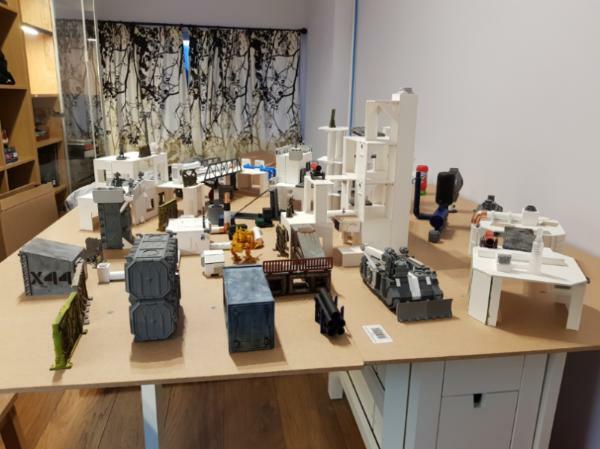 So I got out the whole set for a bit of a lookee. Last time I did that I had this much. 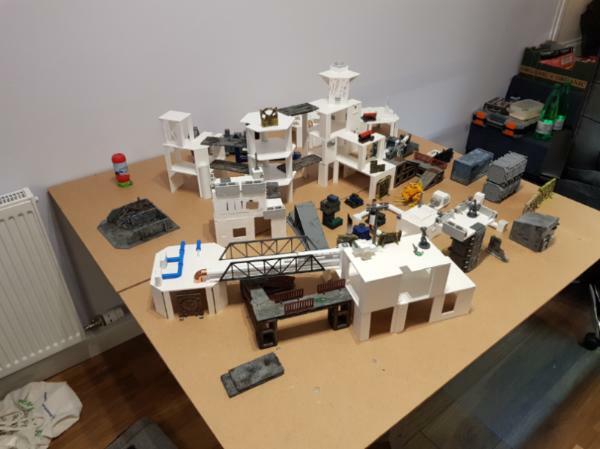 Definately a decent load now Maybe not enough for multiple loadouts but definitely enough to position in lots of fun layouts. 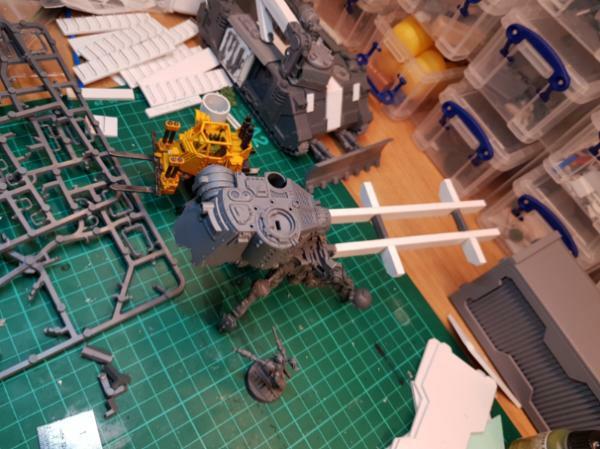 Just put the legs and cockpit bit together for now as I need to do a hell of a lot of dry fitting for a while. The tolerance on the parts is amazingly tight. 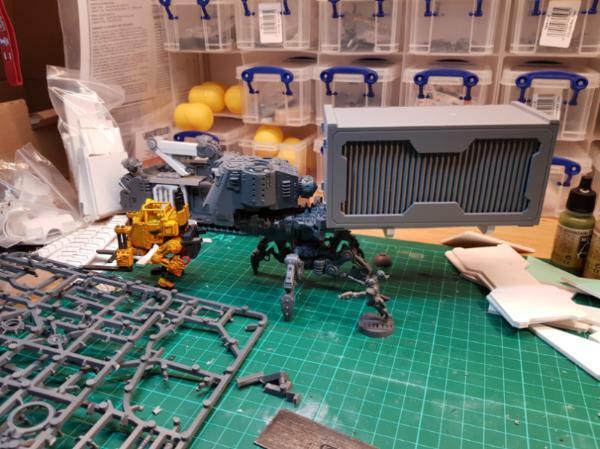 really nice kit to put together. 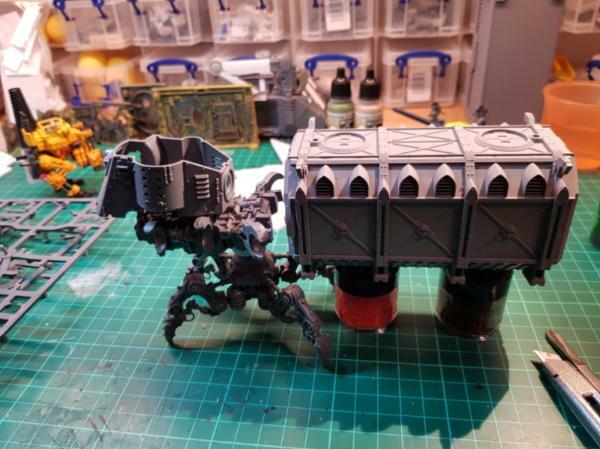 And now that I've done a bunch of containers as scatter terrain I realised the I needed some kind of container transporter... 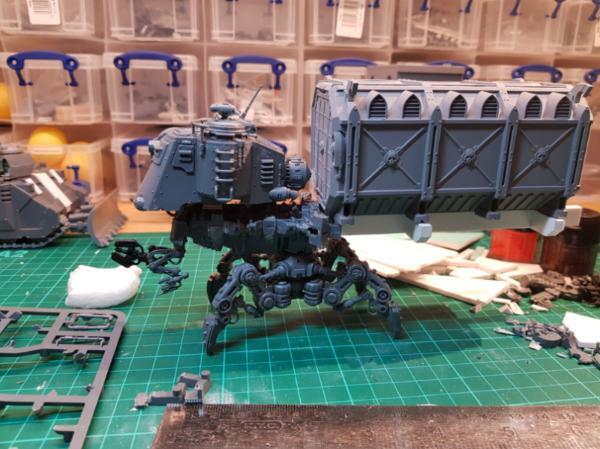 So here comes an Onager based walker transport specifically for.lugging containers around! 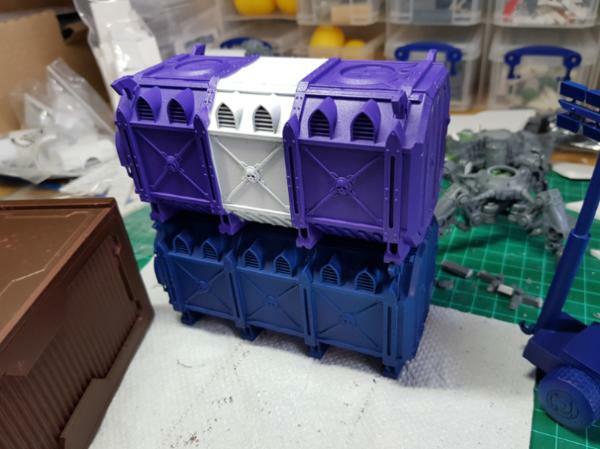 I'm intending to try and make a cargo deck capable of taking both the Munitorum Containers and my Plascraft ones, but we shall.see how well I can make a modular cargo rack. 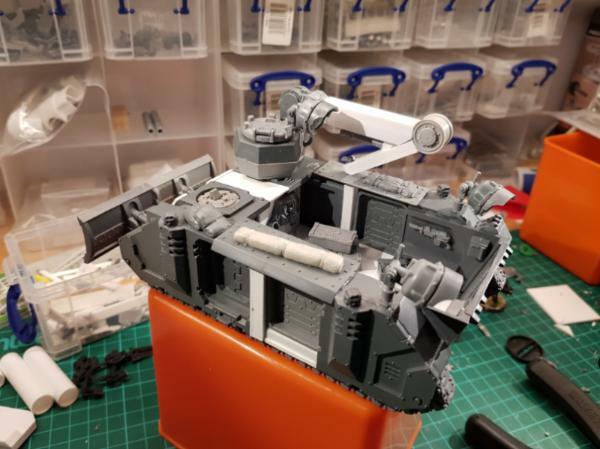 I did toy with putting the legs more centrally under the defiler chassis I'm using to extend the cockpit support, but I think it makes it too back heavy when the containers are in place. 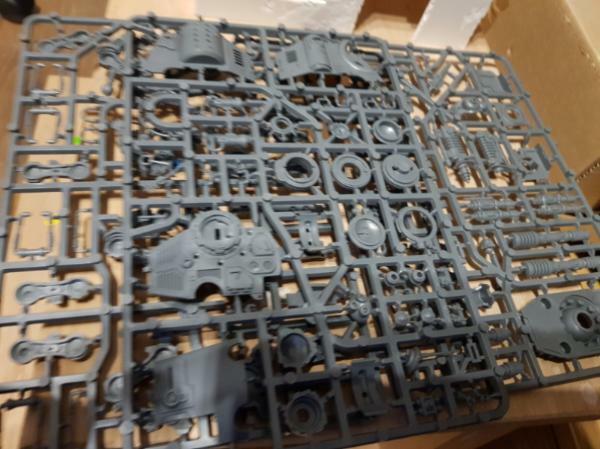 That’s a massive table of Necromunda goodness. 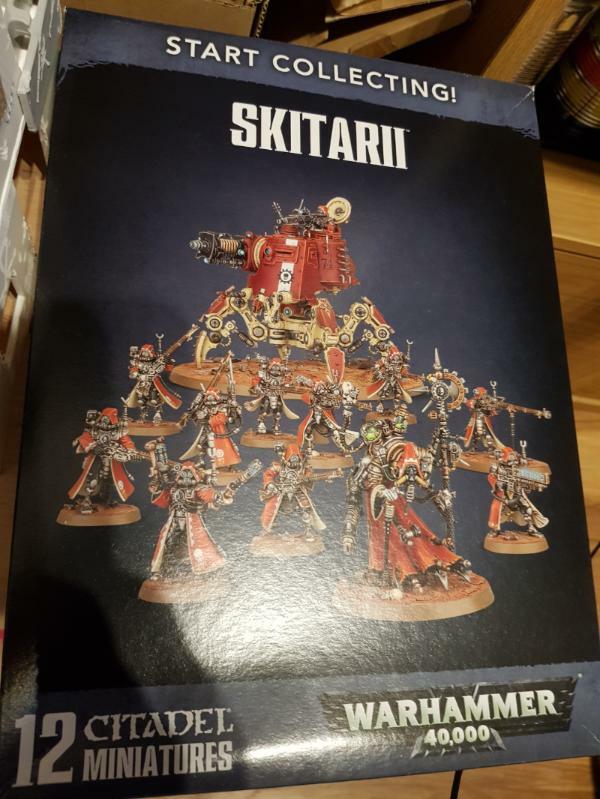 Can’t wait to see how the skitari walker turns out. 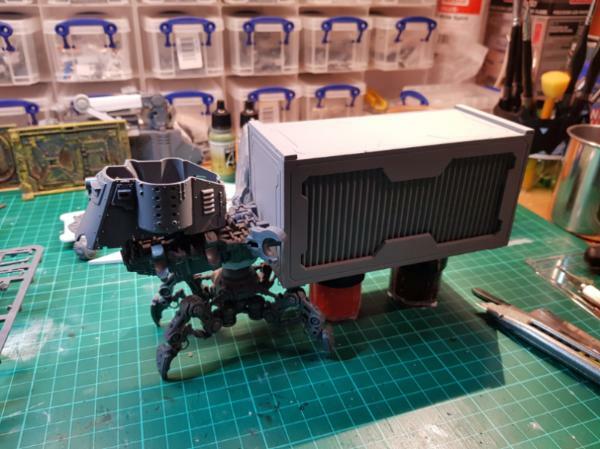 Definitely intrigued to see how the cargo walker grows. Right choice with the off-centre legs, other version looks clunkier. Thanks guys. 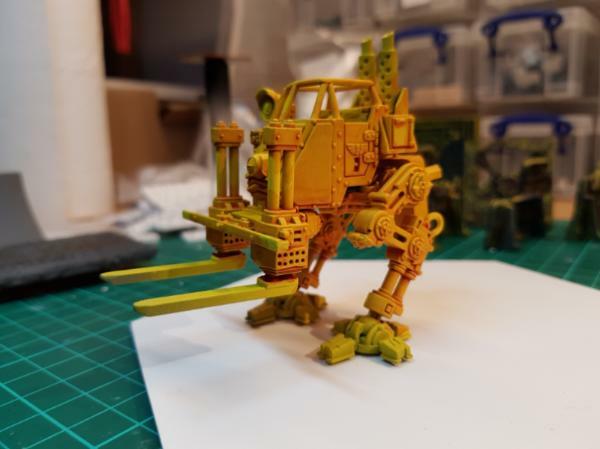 The Onager kit is super lovely. 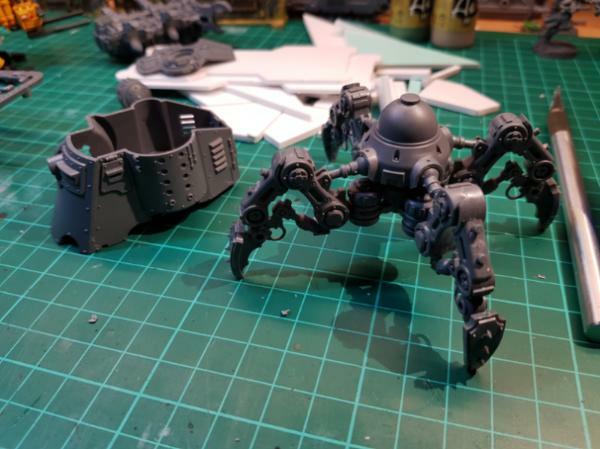 I think you could do all sorts of things with the legs certainly. Ah-ha. Glue and GS dry enough for some interim pics. 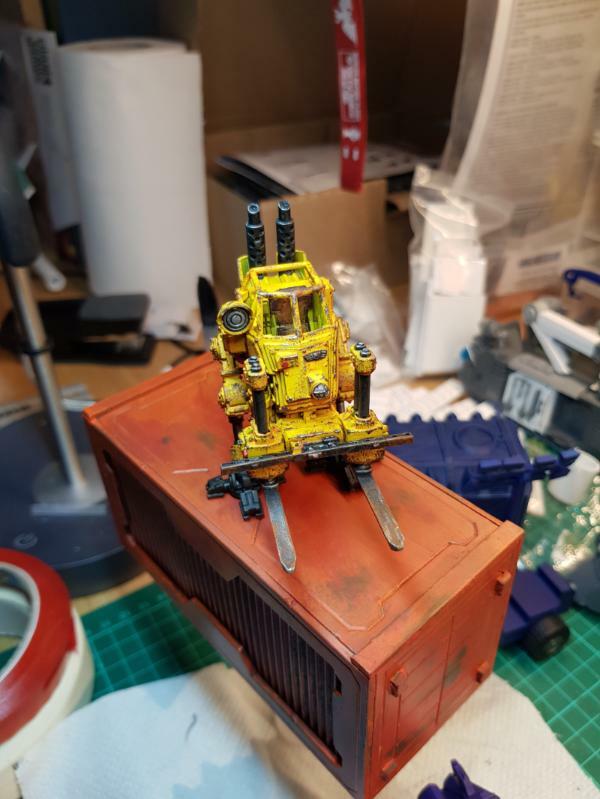 The cab and chassis are both magnetized to allow disassembly for storage and transport, if I ever need to. 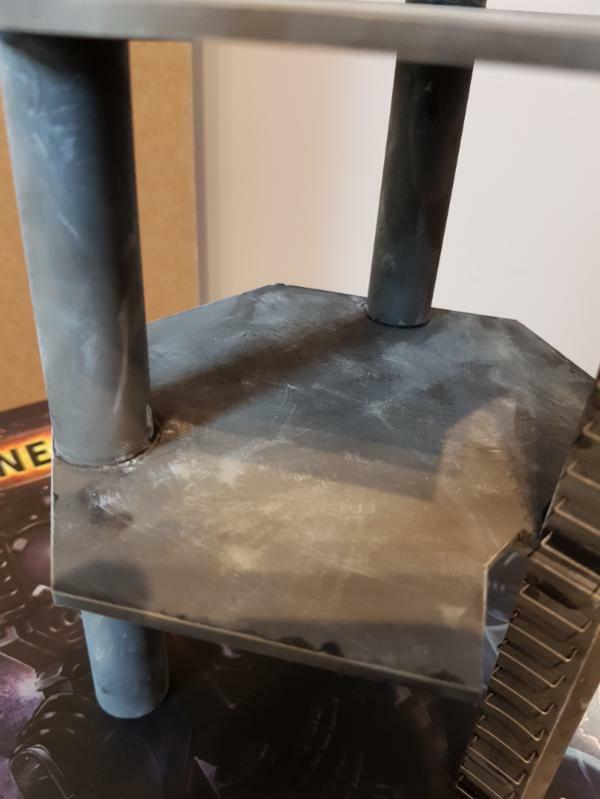 Did you consider a support "wheel" at the back (I use wheel to signify a single wheel, a ball-type affair, a pair of wheels, legs etc) - not sure that it needs ond, just curious as to how it looks with something there. 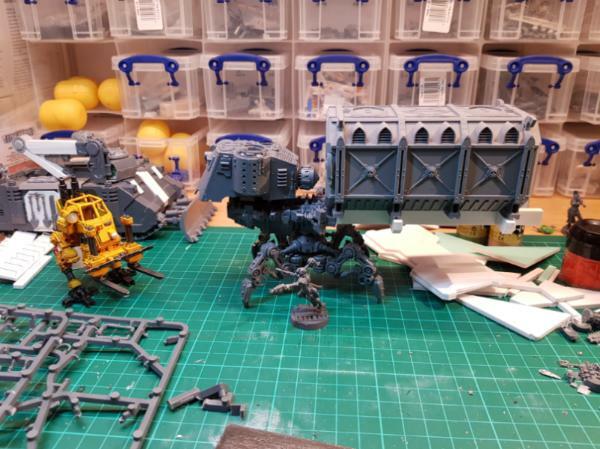 That is a beautiful Necromundan Tarantula. Very insect like, especially the first one. Could be a cool caravan piece headed between spires. 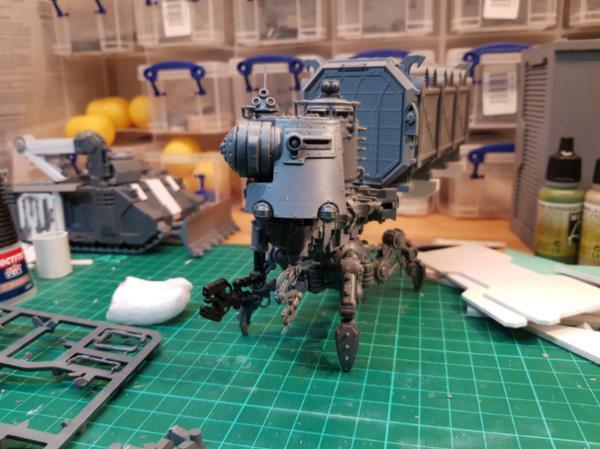 Small update with a bit more of the Onager details fitted. 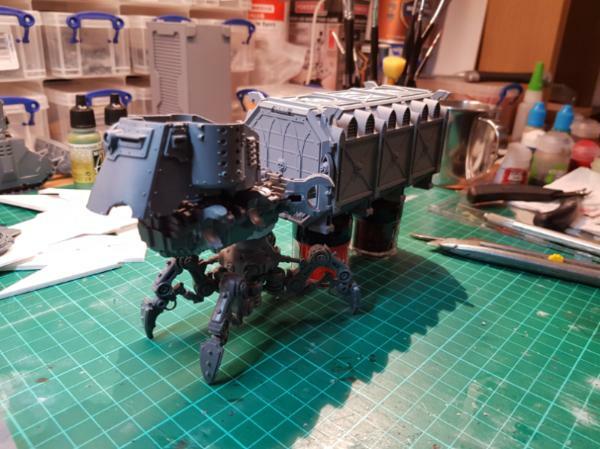 You could say that it has an anti-grav module that supports all the weight, and the legs just move it along. Then it makes more sense to keep the spikes! I say stay with the spiked feet. Maybe you can use the slippers under the cargo container somehow for when it unloads. It means I can keep.the feet for some other project as well, which is a bonus. Definately feeling that suspensor tech is built in there somewhere. Out of.town with work just now but will hopefully.get some more hobby time over the weekend. 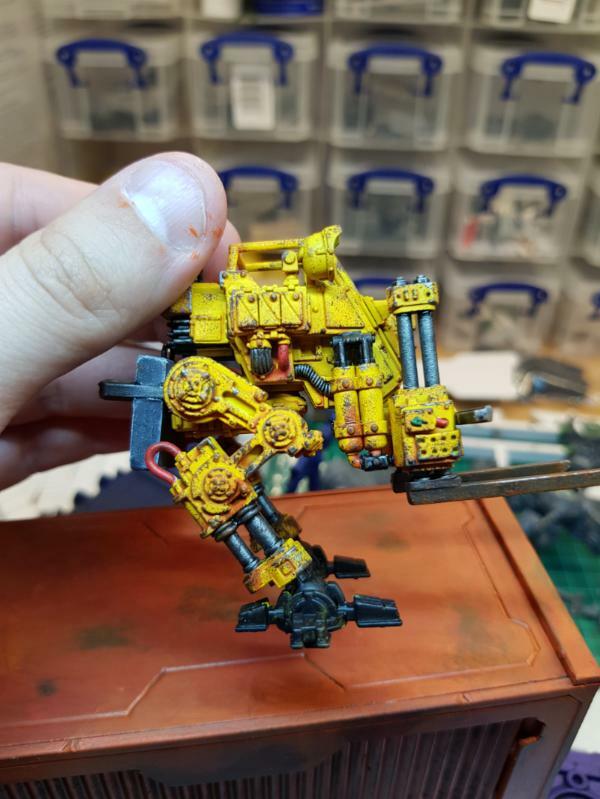 For what my opinion is worth, start painting. 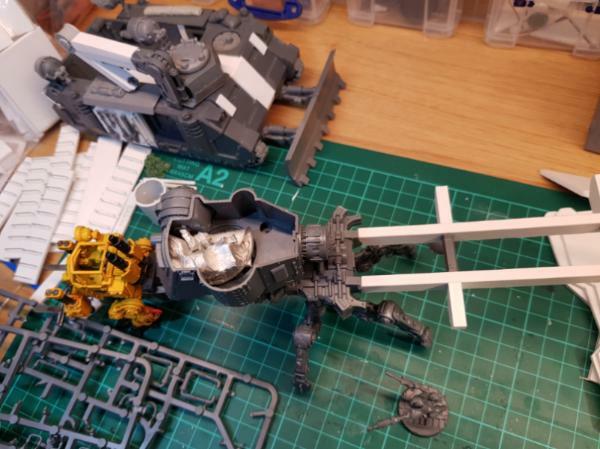 You're already chest deep in awesome, but I've noticed this a LOT on Dakka- buildbuildbuildbulid... and then hate the project because it's overwhelming to paint. 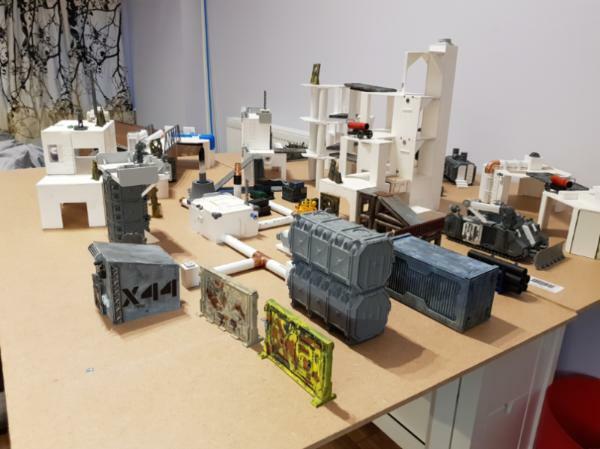 Not taking anything away from the awesome builds you have, the creativity is excellent and I find it inspiring to do some vehicles of my own. Thanks Skalk. 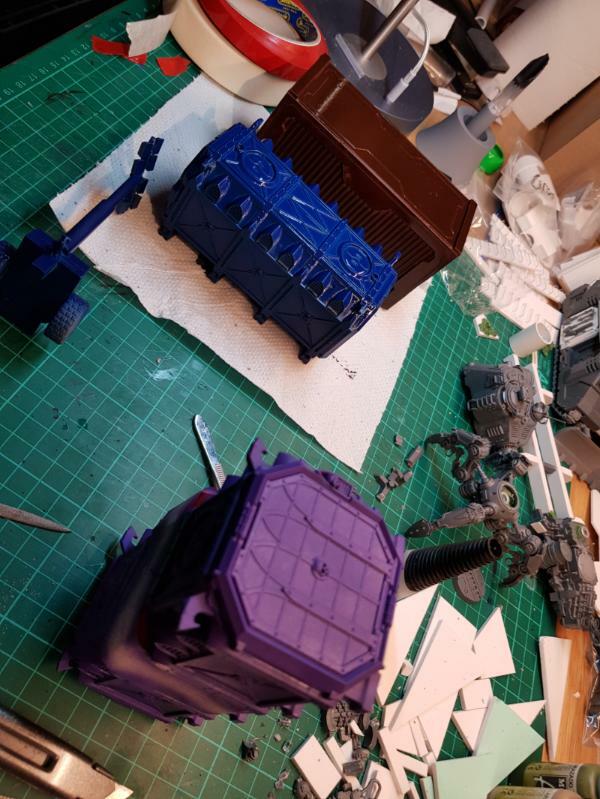 This blog has been on a bit of a slow down because my Van Saar boxes turned up and I've been giving them a bit of love. But I do feel the airbrush calling me.for the scenery again. Work is ramping up.a bit though so it might need to wait until the weekend. 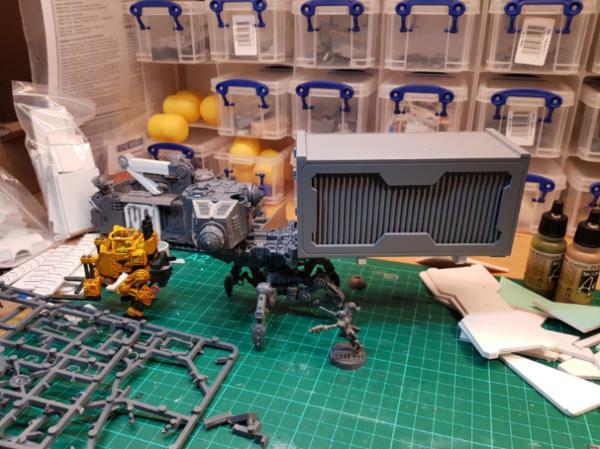 Some lovely looking ideas which i plan on borrowing to transform some of my own scenery. 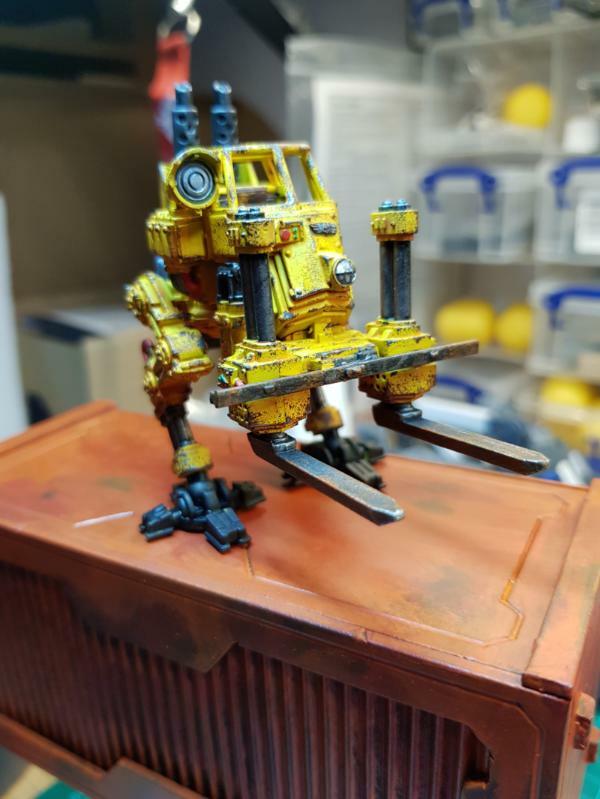 A big fan of your industrial vehicles conversions, the dune crawler has Adeptus mechanicus shenanigans written all over it. Just a quick one, the plaster board filler tape when you put it down is it still sticky? Sorry I'm not familiar with the product and just thought I'd get clarification before I went out and bought a boat load. Holidays... huzzah. Daytime childcare and therefore daytime modelling time. Even more huzzah. So today I mostly stole someone else's idea again. I'm going to say it's Camkierhi again because i went through his thread on terrain basically with a notebook open and ready, but apologies if I am in fact stealing someone else's idea. 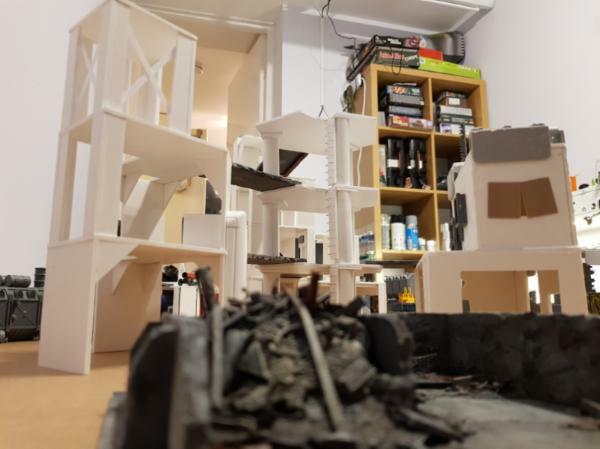 To texture my buildings and walkways I've added some plaster board filler tape. It's self adhesive and easy to cut. I will also be going over all of these surfaces with my dremel a bit later to roughen it up more but for now it's all pretty pristine. Keeep up the good work! 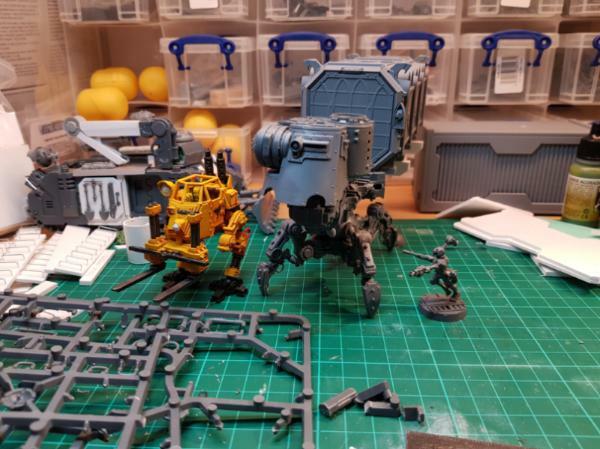 Looking forward to seeing some paint on the walker and the finished sentinel. Regarding the plaster board mesh, it's tacky on one side so it will stick in place unless you are trying to pull it off. It's definately not super sticky. 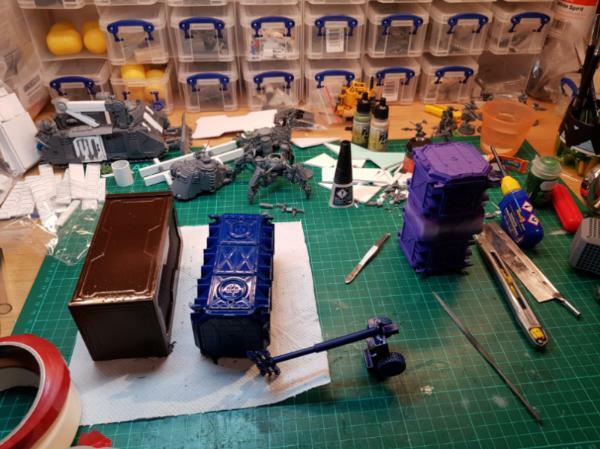 However as soon as you get a few layers of paint on it any residual stickiness that is exposed will be neutralized and the primer should also work to hold it in place. Ah awesome! 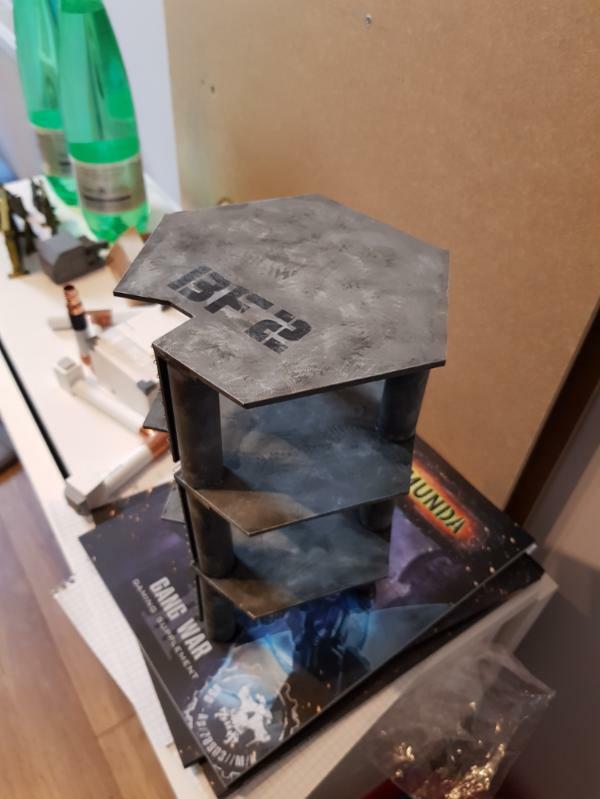 I'll try and get some for sure, I'll be using it for corridors in a zone mortalis esque board. It looks perfect for that sort of flooring. When I get all the pieces I require I'll be making my own thread. 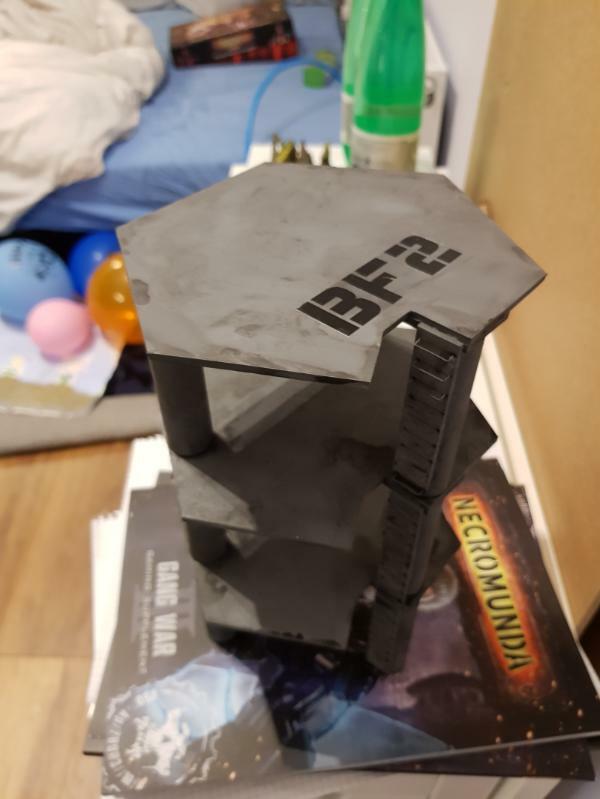 Nice table you got there! 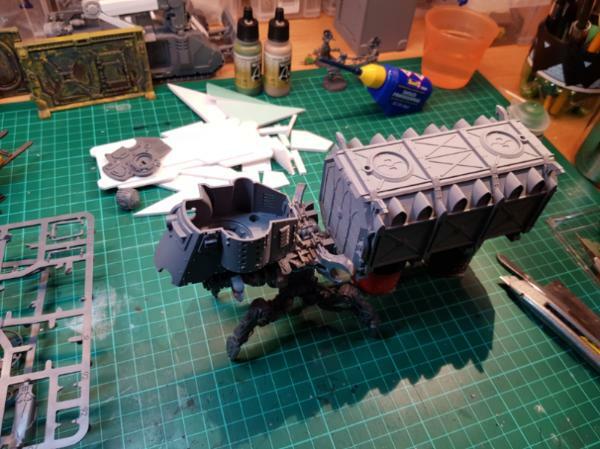 Onager is looking ace as well, those things are going to look great once painted. I managed to get the airbrush out tonight so base coated a bunch of things. 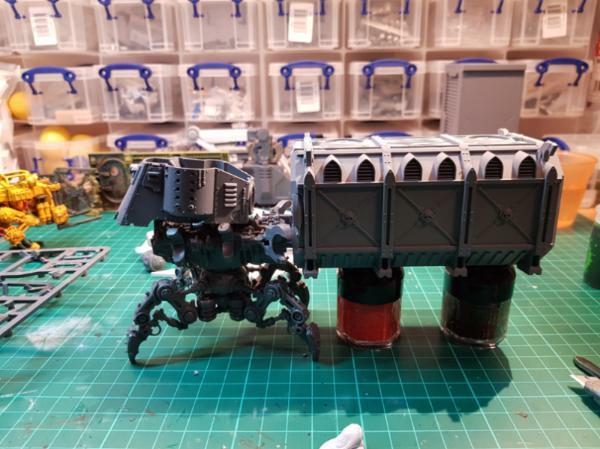 I also.slathered.one of the walkway link buildings with nuln oil. I got quite.an interesting pattern getting it dry a bit then tabbing With a paper towel. 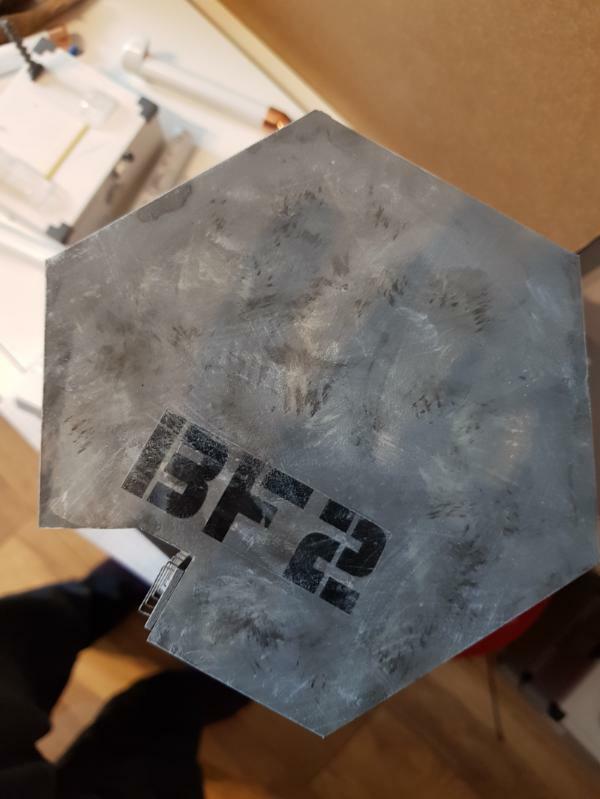 I'll be drybrushing the flippety flip out of it with a variety.of.greys.so it should hopefully build up.into.a.lovely mangy concrete palette. Thanks Boundless. It's a nice grubby effect so far. Hopefully get time to grubby up the containers tonight. You should cut some strips of perspex and put a 9 0 degree bend in them. 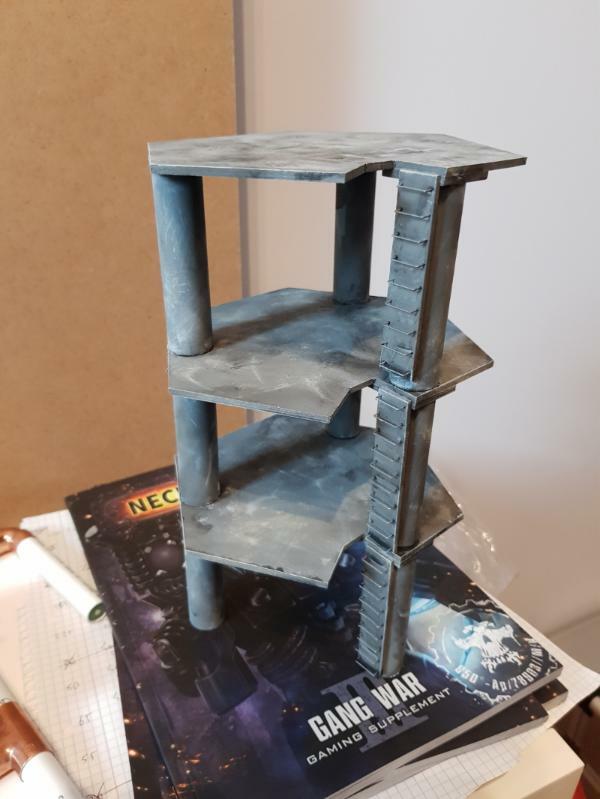 Then, when a model only makes it part way up the ladder you can slot it into the rungs and place the mini in the correct spot. That is an excellent idea, thanks for sharing it. No worries. If you're going to the trouble to make actual rungs then might as well use them for something! For bending, cover the perspex with a couple of pieces of wood except for the strip you want to bend. Heat with a heat gun and then bend over a piece of wood. Take care to get the bend line perpendicular or the platform you create will be wonky. Thanks for the idea Scott. I'll Definately keep it in mind. I'm not.sure how strong the staple friction bond is, but I'm sure I could superglue them back in if they fall out. Work.is intruding again unfortunately but hopefully get a bit of time for.more container shenanigans this weekend. 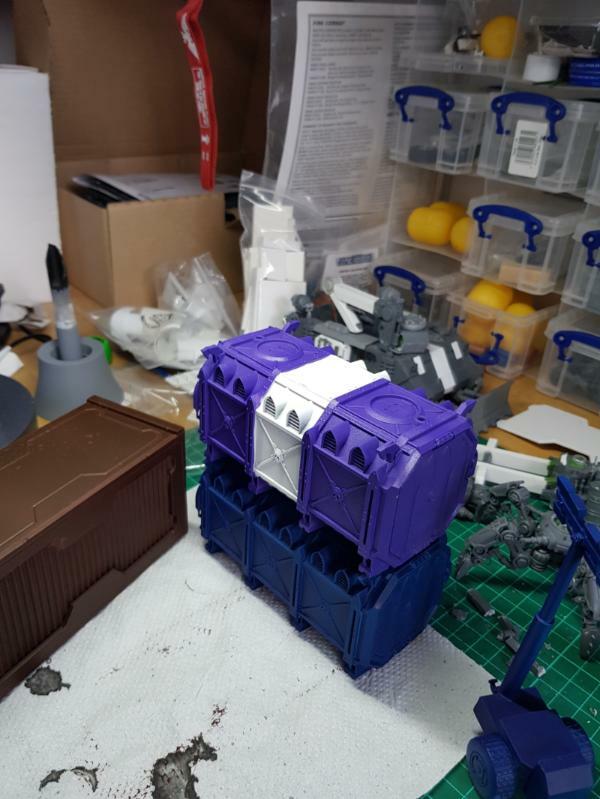 A bit of container shenanigans in the background, but this update is all about Jekub. 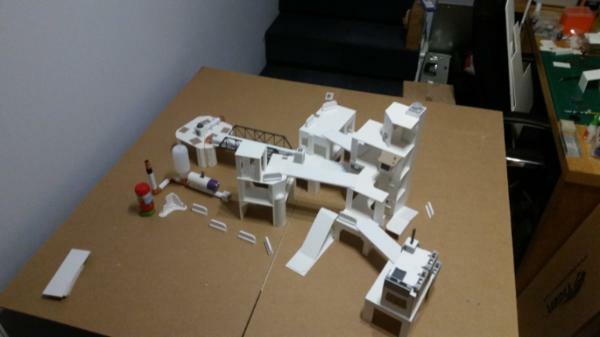 I think it's pretty much done. Nice and grungy but with the work bits still reasonably well maintained.